THE STORY - Based on the true story of well-regarded French writer, Gabrielle Sidonie Colette, set during the first half of the 20th century. A country girl who marries a writer known as “Willy” fifteen years her senior. He soon discovers her talents for writing and uses her for her skills. Colette must forge a path of her own, establish her own credibility and explore life and love on her own terms. THE GOOD - This film is beautiful and the costumes are stunning. Although it is a period piece, it does not take itself too seriously. The standout is the evolution of Keira Knightly as Colette. She shines brilliantly in this role, as a woman who is far ahead of her time. THE BAD - There are some elements that drag the pacing in the second act. Although Colette faces adversity, it does appear that some the choices come easier than when would expect from the era. The film chooses to stay on the positive side of the battle she must have fought, without focusing in on the reality of the pain and hurt that would have accompanied it. Exploring the anguish further could have lead to a more robust finished product. ​​​​Gabrielle Sidonie Colette (Self proclaimed as Colette) was a country girl, who was enamored with the charms of Willy (Dominic West), an established, writer and well-known ladies man. They marry and Willy takes her to Paris to begin their life together. There is a significant age difference of 15 years and additionally, Colette is overwhelmed with the culture shock of her new environment. She quickly catches on to Willy’s wandering ways, bad habits and misuse of money. During a time where Willy finds himself unable to create the publications to keep him afloat, Colette begins to write and discovers her creative voice in a character she calls Claudine. Although initially, Willy is not supportive of her work, he later revisits it and publishes under his name, citing the times and his already established reputation as the reason. The characters population soars, more writings follow and the couple finds themselves at the top of Parisian society. 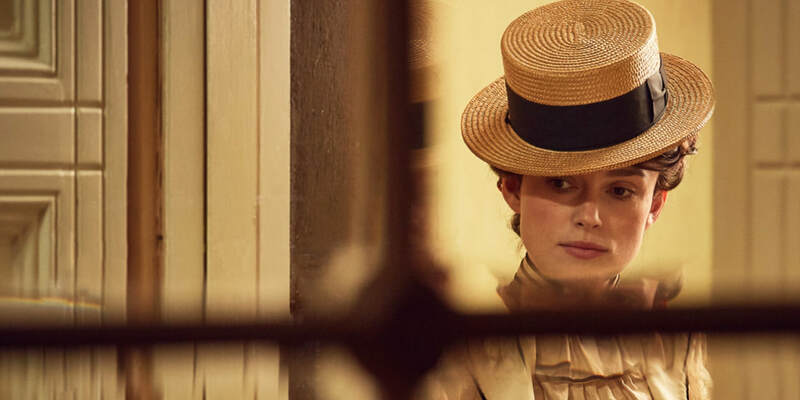 While on this rise, Colette begins to explore her sexuality, with an ostensibly approving Willy, who does not want to lose the talent that has brought them their success. They enjoy a lush life both in city and country and enjoy an open relationship. Eventually, Collette develops a romantic relationship with a socialite lesbian, named Missy, who affected male dress and challenged the norms of the time. It was through this relationship that she begins to explore other elements of her creativity and come to terms with the damage that her marriage was causing for her and for her art. The best part of this film is the performance of Keira Knightly. She truly evolves into the character of Colette with an ease of believability that deserves recognition and praise. Dominic West also holds his own in the story and manages to be likable in odd ways while still being the antagonist of the film. Never before has he been this arrogant yet so charismatic and magnetic. Both actors deserve credit for the layers they brought to these characters. The visual elements of the film are also a standout. The costume work was nuanced and exciting and because of the broad strokes of Colette’s personality, a variety of work was showcased. The visuals were bright and showcased both city and country elegance. Seeing as I viewed this as a premiere at the Sundance Film Festival, it was hard not to compare the vibrancy of the film to a period piece I had seen earlier in the day, entitled “Lizzie." Albeit the bleakness of "Lizzie" due to the subject was intentional, the contrast brought the visuals of "Colette" to life for me even more. I can certainly offer strong consideration to the costume design by Andrea Flesch, for potential an Oscar nomination come later this year. Although it would be a first-time nomination and of course entirely dependent on the strength of the field this year. The production design by Michael Carlin is also worth noting, as he was also nominated in 2009 for his work on “The Duchess” and does excellent work with this film as well. Director Wash Westmoreland is best known for his work on “Still Alice” and does nice work in bringing together all of the different filmmaking elements for this period film. Lastly, I have to call out the joy of this score by Thomas Ades. Again, in the way the production design and costumes highlighted the vibrancy of who Colette was, the score does the same thing. Another example of choices made to differentiate the film as something different. The writers took an interesting approach to this film by keeping much of the dialogue light and not overly thematic. This definitely added an enjoyability factor to the film, but at times it was also distracting. I fear that this choice did not give Knightly or West the full opportunity to demonstrate their range of skill, nor do I feel like the appropriate level of gravity for the choices the characters were making was ever felt. In summary, Colette was an interesting woman and the film does very well to capture that. Her spirit and tenacity are felt in the vibrancy of the color and costume choices and Keira Knightly does some of my favorite work of hers in this role. The film takes some chances to reinvent “the period piece” in some ways with more success than others, but credit must be given for a strong finished product that is well worth your time.